Pavel Dmitrichenko, the Bolshoi dancer convicted and jailed for ordering the infamous acid attack on his boss at Russia's chief ballet company, is reported to have been back in the Bolshoi doing ballet class for the past month, hoping to return to the stage. An anonymous source, claimed to be another soloist, is quoted by the newspaper Moskovsky Komsomolets describing the reaction of most of the dancers and theatre staff as welcoming, taking the view that he has served his term and earned his right to have his life and career back. The paper speculates that Bolshoi general director Vladimir Urin has approved Dmitrichenko's security pass to enter the theatre, and quotes a new Dancing Times interview with Urin in which he is reported as saying the 'main question' now is whether the former dancer can recover his old dancing shape. Surprisingly, no mention of any other question over Dmitrichenko's suitability to rejoin the company he brought global notoriety upon. The report says he is working hard to recover his stage form, despite a physique that has thickened during three years in the cells. He was released in May on parole for good behaviour, having served half his official sentence of five and a half years. The reporter does not mention Dmitrichenko's recent reported repudiation of his admission of guilt at his 2013 trial, nor does it comment on the victim, Sergei Filin, whose sight was permanently damaged by the attack, and who was later dismissed from his job by Urin. Filin remains at the theatre supervising a choreography programme. His opponents, Dmitrichenko and the dismissed Bolshoi star Nikolai Tsiskaridze, now head of the Vaganova Ballet Academy - who gave evidence supporting Dmitrichenko in his trial, attacking Filin - have maintained that Filin's injuries are a fiction in which German doctors and Moscow police were also complicit. Here is my translation of today's article. The Bolshoi Ballet ex-soloist Pavel Dmitrichenko, jailed for 5 and a half years as the organizer of the "acid attack" on the Bolshoi Ballet artistic director Sergei Filin, has returned to the Bolshoi. On May 18 he was released on parole after serving half his term (three years and three months after his detention in March 2013). Moskovsky Komsomolets has discovered that Dmitrichenko has already been going to the Bolshoi for the past month for morning classes with teacher Vladimir Nikonov in order to recover his form and then attempt to return to the stage. Dmitrichenko himself prefers not to talk with the press, but how has the company reacted to his appearance? One of the Bolshoi Theatre’s soloists agreed to talk to MK on condition of anonymity (the dancers are still unwilling to be candid with journalists). “He's served his time, and that is considered to mean that a man has atoned for his guilt and by law has the right to return to his profession. Ie, to get his life back, his career, to start afresh with a clean sheet. In that sense, my reaction to his decision is to respect it, and be positive. 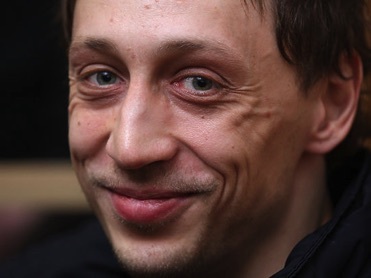 "It's another matter whether Pavel can return to the stage at the Bolshoi after three years in jail, without the conditions required for ballet class. Though I do know that even under those conditions he did not stop doing ballet class. MK: Is it known who got him a security pass for classes and rehearsals at the Bolshoi? And did the theatre directorate know? MK: Have you seen him in class? “He goes to a morning class with Vladimir Nikonov. If one’s talking objectively about his form, then now he’s... not fat exactly, but he is bulkier. Maybe you could say he's more pumped up, which of course for ballet isn’t that good. But I know that he is a really persistent guy, very very tenacious. Pasha knows how to set himself goals and he is quite capable of getting back into the right form. And everything is going well in class. "I have heard vaguely, and I’ve even seen on Facebook a photo of a performance (if it isn’t Photoshopped) where supposedly quite recently he returned to the stage for the first time after jail and danced Prince Siegfried in Swan Lake with some enterprise or other, or maybe it was a concert. Ie, this is a guy who really wants to return to his career. MK: How do you feel about his appearance back in the Bolshoi? In fact, after the attack the company split in their reactions, some of them condemned him, but the majority did not believe in his guilt and signed a petition in his defence.. What’s the situation now? “Yes, he came to class, he arrived, they say, in a new Mercedes. But then they didn’t see him for a week. Urin gave him a pass for 2 or 3 months. It would be impossible to get a pass for such a long period without the say-so of the director.